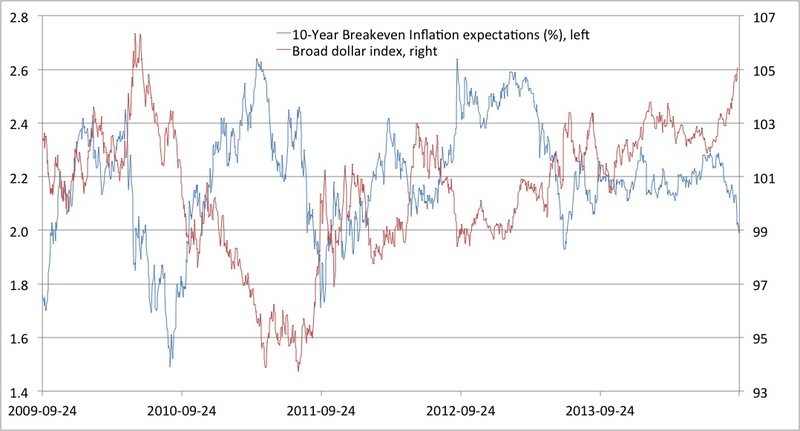 As the graph shows not only has the dollar strengthened since July, but inflation expectations have also dropped somewhat and interesting enough we have now 10-year break-even inflation expectations below 2%. It is only the second time that that have happened since the Fed officially introduced a 2% inflation target in January 2012 (see here). Obviously we cannot directly compare the Fed’s inflation target and 10-year inflation expectations, but the decline in inflation expectations nonetheless is very indicative of the scale of monetary tightening that is expected from the Fed. The graph also shows there is a very close negative correlation between the performance of the US dollar and US inflation expectations. This obviously can easily been explained from a monetary perspective. Expectations for Fed tightening (easing) will both cause the dollar to strengthen (weaken) and cause inflation expectations to drop (rise). The close correlation between inflation expectations and the dollar means that a continued strengthening of the dollar will be a clear test of the Fed’s credibility and if the dollar continues to rally then it would be very obvious to everybody that the Fed’s credibility would be under pressure. I am not speculating here whether the dollar rally will continue or not, but rather whether Fed’s inflation target is credible or not? Yellen’s desire for consensus at all costs has given the hawks control of policy. Hence low inflation expectations, low growth, low bond yields. Yes, I think the Fed is shooting for 1.5 percent inflation, whether they say so or not. Anytime the PCE gets close to 2 percent, the Fed loses nerve. Despite the fact that 2 percent is an average target, the Fed has credulity that 2 percent is an inviolable ceiling. Can we see robust recovery with 1.5 percent inflation. I do not think so, unless there were deep cuts in FICA taxes….